PHOTO CAPTIONS: 1. 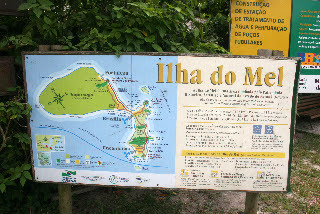 The map of Ilha Do Mel, 2. 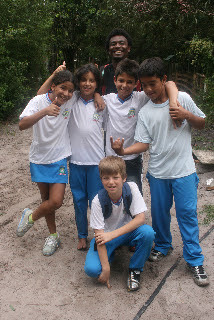 Andre poses with the Capoeira students, 3. I show them video of themselves, 4. The easy part of the hike to Encantadas, 5. 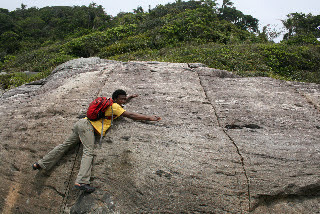 The harder part of the hike, 6. Our feet and a tiny sand dollar, 7. & 8. 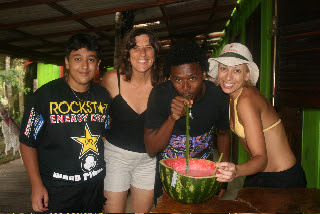 Local friends invite us to drink a mix of watermelon juice and vodka. Encantadas -- named for the beautiful women who enchanted men. They say it's a legend, but I can tell it's still happening today in Brazil. It seems like I'm the only one around here without huge cleavage and wild curly hair. At least Andre's pretending not to be too enchanted by all the competition. The guidebook says that the local word for bikini is the same as dental floss. Gee, I can't wait to get to Copacabana! We’ve been on the tiny island of Ilha do Mel for 5 days and I think we’ve seen all the major attractions. Yesterday we walked 2-1/2 hours to the village of Encantadas and 2-1/2 hours back. I read the total distance is only 4.4 kilometers, but with all the up and down, over boulders and mountains, it seemed much farther. We also walked along long stretches of deserted beaches. It blows me away. Where are all the tourists? In Encantadas we ran into a French couple who we’d met on the train ride from Curitiba. 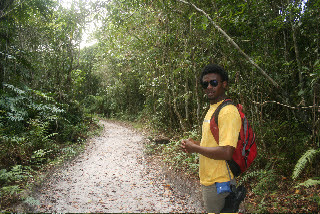 It wasn't hard to find them because they were about the only tourists left after the weekend rush of Curitibians. Our friends had hiked to the Fortaleza from Encantadas the day before, a half hour beyond our village called Brasilia (not to be confused with the capitol of the country), and they were nursing their sunburns in the shade of a large palapa. The French couple are traveling for 7 months for the 3rd year in a row. They live rent-free with his parents, sell popcorn and snacks on the beach for 5 months, then take off. So far they've been to Southeast Asia and India. They're thinking to leave Brazil earlier than they planned since they've heard that Uruguay and Argentina are cheaper. That will be a relief for us too. They introduced us to Marco from Buenos Aires who works at the hostel. He’s about the 100th person to tell us we have to visit Iguazu Falls. I liked him immediately because he hates cars and television. His best line was that Portuguese sounds like children speaking Spanish. The two languages are quite similar and it's getting easier to communicate. Now we’re thinking about changing our route to go to the falls sooner. Maybe even splurge on a helicopter ride. We’ll go back to Curitiba tomorrow. I can get a few glitches on my Mac worked out at the Apple dealer there. Then we’ll take the night bus to Iguazu Falls. We’ve heard that the border crossing into Argentina is quite easy there because many tourists want to see the falls from both countries. From Brazil you get the overall panorama and from the Argentina side you get a close-up look and feel. We found out that we can pick up Andre's Uruguay visa in Buenos Aires, just as soon as we get a hotel reservation in Montevideo. Turns out that my friend Gabriel can't sponsor Andre because he's only a student, not a resident of Uruguay. We’ve made a lot of friends in the short time we’ve on this island. Nelson and Lyz invited us to sample some watermelon vodka drink. Andre said it was good, but since I don’t drink alcohol, I only faked it. This morning we ran into some kids who asked if we knew capoeira. Andre isn’t familiar with it, so I asked for a demonstration. 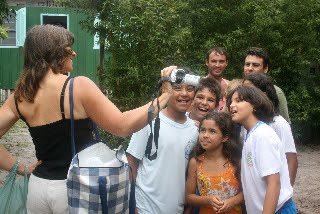 Afterwards, they had fun watching themselves on my video camera. You're having fun - obviously. as soon as you arrive, will you? !